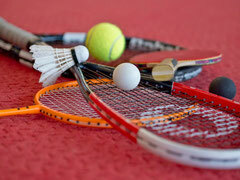 Tabletennis – Badminton – Squash – Tennis! Rules of Racketlon are here. One opponent - four games - one winner. Starting with tabletennis- continuing with badminton - battling in squash - and finishing with tennis. That's Racketlon. Racketlon is the sport in which you play your opponent in each of the four racket sports table tennis, badminton, squash and tennis. A Racketlon match contains four sets, one in each sport. The winner is the best all round racket player. This document contains the official rules of the game of Racketlon according to the International Racketlon Federation. The game must be built on the concept of a Racketlonmatch involving the same two individuals (pairs in doubles) playing each other in all four sports - with identically formatted sets being played in each sport. Each rally must count. The player (pair) who wins most rallies in total is the winner of the Racketlon match. Any sport that fulfils the three principles above is Racketlon. Any other sport involving the combination of several racket sports might be termed “multi racket sport” - but is not Racketlon. Each set is played to 21 points. Every rally results in a point to the winner of the rally - i.e. “running score” is applied. At 20-20 the set is extended until there is a margin of two points. A set can thus end e.g. 22-20 or 25-23 but never 21-20. The winner of a Racketlon match is not the one that wins most sets but the one that scores the most points in total. This means that it is possible to loose three out of the four sets and still win the match. If any of the players so wishes the match shall be stopped as soon as (a) the winner has enough points for the match to be decided - AND (b) the rest of the points have no other significance. (Note that group play is sometimes decided through counting total points difference. In that case (b) might apply and the rest of the points might still have significance for the result of the group, in which case each match shall be played to the end.). If, after 4 sets, both players have exactly the same number of points, then the tennis set is extended with one single point, known as the “Gummiarm Tiebreak”. The winner of this single point tie-break is also the winner of the full match. Server is decided by the drawing of lots. The winner of the lot chooses whether to decide who gets to serve or what end to play at. The loser gets the remaining choice. To off-set the server’s advantage there is no second service in the single point tiebreak. The winner of the toss decides whether to start serving or receiving in table tennis. The player, who starts serving in table tennis, starts receiving in badminton, starts serving in squash and starts receiving in tennis. In each set the player who starts receiving decides what end to start the set from. After every two points the serve goes to the other player. At the first of these two serves the server always serves from the right (except table tennis). The second serve is from the left side. Ends are switched at the time when 11 points are first reached by one of the players. After 20-20 the serve switches hand at every point until the set is decided. The two first serves are from the right, the two next serves are from the left and so on. In tennis, the server has two chances - first and second service - just as in normal tennis.